Recruitment are 81 posts. 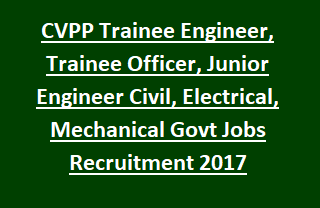 Interested candidates may apply through online using CVPP website www.cvppindia.com from 18-11-2017. Upload the application along with fee before 15th December-2017. CVPP will conduct written examination and Interview to finalize candidates for Junior Engineer, Trainee Engineer vacancies. Written exam will be held in the month of January/ February-2017. Download the admit cards 7 days before the exam date. Candidate must have to visit the official website for regular updates. For more details regarding Application process, Important Dates, Application fee procedure, Selection method, Educational Qualifications of Chenab Valley Power Projects Private Limited CVPP Recruitment of 81 Junior Engineer, Trainee Engineer, Trainee Officer vacancy are mentioned below. Available vacancies in Chenab Valley Power Projects Private Limited CVPP Recruitment are 81 posts. 1. Trainee Engineer (Civil, Mechanical, Electrical, IT and E&C): 47 posts. 2. Trainee Officer (Finance, HR, Geology & Law): 11 posts. 3. Junior Engineer (Civil, Electrical & Mechanical): 23 posts. Trainee Engineer: Full time BE/ B.Tech/ BSc Engineering in relevant discipline from AICTE/ AMIE approved Indian University/ Institute. Junior Engineer: Full time Diploma in Civil/ Electrical/ Mechanical Engineering from recognized Institute. Maximum age limit for all CVPP Vacancies is 30 years. Pay Scale for Trainee Engineer, Trainee Officer is Rs. 16,400- 3%- 40,500/- per month. Pay Scale for Junior Engineer is Rs. 14000- 3%- 41,100/- per month. Candidates will be selected for CVPP Trainee Engineer Vacancies is based on their marks secured in written test and followed by Interview. Written Examination will be held at Jammu only. Written Exam consists of Objective type questions conducted for 200 marks. Numerical Ability/ Quantitative Aptitude, Date Interpretation etc. Interested candidates can apply online from 18-11-2017 using the official website of CVPP @ www.cvppindia.com. Before applying candidate must scan their recent photograph and required certificates/ documents. Upload the scanned documents, Photographs along with the application before 15-12-2017.